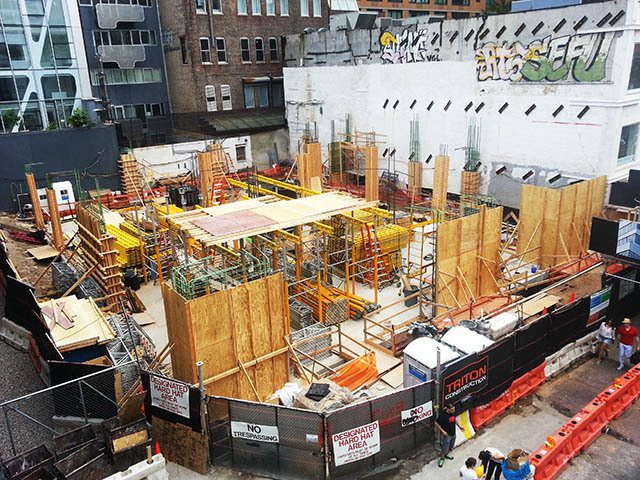 The foundations for 508 West 24th Street have been completed, and the future 10-story building is now going vertical, with work on the first floor just beginning. With only fifteen units, 508 West 24th will fall into the ’boutique luxury’ category – all but one of the condominiums will be larger than 2,300 square feet, and prices are expected to top $3,000 per square foot. The project’s architect is Cary Tamarkin, and 508 West 24th will look phenomenal – the design seems to draw inspiration from classic Bauhaus. Per The New York Times, which also has renderings, the building will be defined by “ribbons of architectural concrete between rows of oversize casement windows,” which lead to a final product that has refined, mid-century aesthetics – a stark contrast to neighbors like the also-attractive but decidedly contemporary HL23. For those not living in the building, 508 West 24th will integrate a large clock into its eastern wall, which faces The High Line – another addition to the elevated park’s art collection, and a nice touch on Tamarkin’s part that will add to the pedestrian experience. The project is expected to be completed next year.